has eaten raw squid recently. It's tough to figure out where the movie Violent Cop came from. No matter what Fox Lorber thinks, actor/writer/director Takeshi Kitano's Violent Cop was made during the height of Japan's recent economic boom, when employment was at its highest and crime was at it's lowest. Yet the movie portrays a Japan in which practically everyone is a sociopath. Was Violent Cop intended as a satire? A cautionary tale? We have no idea, but Violent Cop is the most engrossing, grab-you-by-the-nards police drama we've seen in a long while. 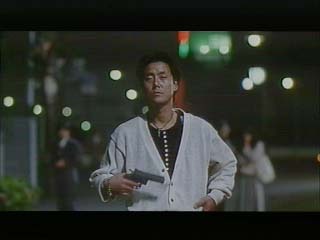 Azuma (Kitano) is a cop with some metropolitan Japanese police force. In the opening scenes, we see Azuma pay a visit to a suburban kid who was with a gang that beat up an old man for no reason. After exchanging pleasantries with the kid's mother, Azuma goes to the kid's room and roughs him up until he turns himself in. This is pretty typical of Azuma's approach to police work. This is not to say that Azuma shows glee or even satisfaction when he violates a suspect's civil rights. 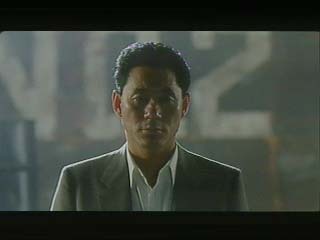 In fact, as played by Kitano, Azuma never shows any emotions at all. We hear that at some point after making this movie, Kitano was in a motorcycle accident that paralyzed half his face. We've seen a movie he made after the accident, and we can say that his disability did not seem to effect his acting style at all. Azuma stays a cipher to the audience all the way through Violent Cop. Just another day at Clint Eastwood's house. Most of the movie involves Azuma investigating a drug-related slaying, but we do see a little of his home life. He lives with his sister, and in one bizarre scene Azuma gets home to find a naked man in her bed. The man hastily dresses under Azuma's predatory glare, then makes his exit. Azuma follows the poor guy and kicks his leg out from under him as the man tries to go down the stairs, then follows him all the way to a bus stop, berating him the whole way. The weird part is that the sister never reacts to the drama going on right in front of her. We later find out that she is probably retarded or imbalanced in some way. As Azuma follows the drugs back to their source, he and a bunch of his partners (including the inevitable rookie, who seems to be the only cop in the film who isn't a thug) try to apprehend a suspect. The man resists arrest, and kills a cop with a baseball bat blow to the head. In a stark contrast to America, even after this, the Japanese cops don't pull their guns, but Azuma does take the opportunity to run the fleeing man over with a car. Sure, it's a Japanese car, so it doesn't hurt the guy much, but still. For this wanton disregard of police procedure, Azuma's boss makes him write an apology. That will learn him! But as a final act of defiance, Azuma only takes one sheet of the paper the chief offers him to write the undoubtedly heartfelt expression of regret. As the investigation goes on, Azuma is set on a collision course with drug lord Nito, who employs a sadistic hit man named Kiyohiro (Hakuryu). Kiyohiro gets Azuma fired from his job, and the movie ends with a series of increasingly violent and destructive conflicts. The violence in Violent Cop is graphically portrayed and extremely disturbing. This movie's style is the opposite of John Woo's exhiliratingly choreographed gunfights. Death in Violent Cop comes swiftly and without warning, and not always to whom you'd expect. Amazingly, this very self-assured film was Kitano's first film as a director. 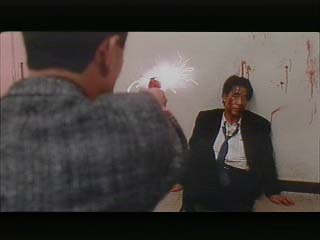 Even more amazingly, Kitano's reputation before this film was as "Beat" Takeshi, a member of a comedy duo. Pretty amazing, considering how humorless and cynical the film is. 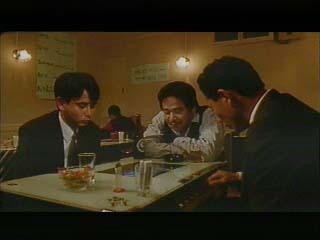 Kitano's later films would not necessarily be much more uplifting, but they would feature scenes of quirky, endearing behavior by their heroes, like the paper doll sumo wrestling by the gangsters in Sonatine. There is no such lightness in Violent Cop. This movie has often been compared Dirty Harry, but the Dirty Harry films encourage us to root for Harry. Violent Cop gives us no one to root for, but you won't forget it. assassins by their sweater vests. * The filmographies on Fox Lorber's recent DVD of the movie insist, several times, that Violent Cop was made in 1998. In fact, it was made in 1989. Go back! * Who acts as "Takeshi." Just one name, just like Rosanne.Go back!